I thought I’d give a little update on my life since i’ve been completely MIA for weeks. First of all, I’ve been thinking of tons of new posts that I will have coming up that I am so excited about.. SO STAY TUNED. Secondly, I have been neglecting this precious page because of college. The last few weeks were insane but now the semester has finally come to a close and I am ready to enjoy the summer. I will be posting so MUCH because summer is my time to shine. I am in the process of planning a summer road trip to Tybee Island, Georgia.. and honestly it’s harder than it sounds trying to get 4 college students with low-paying jobs to have a decent getaway. If it all comes together expect several posts about the trip (which should happen towards the end of July). Also, something exciting happened a few days ago. My boyfriend got a NEW PUPPY. 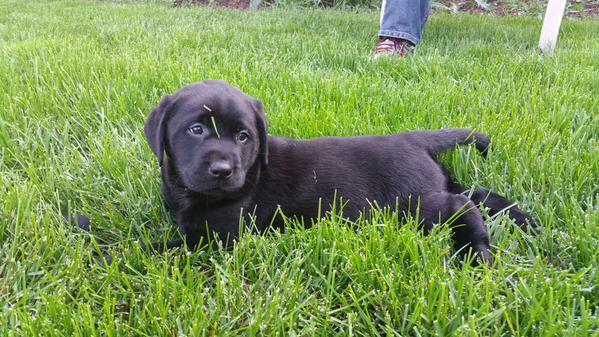 It’s a baby black lab and it’s the cutest damn thing to ever walk this earth. Her name is Daisy and I’m obsessed with her. So those are the new cool things happening in my life.